It’s no secret that values for the vast majority of Bruichladdich bottles have been somewhat off the pace recently. A significant and sustained slump in the market for limited edition ‘Laddies has seen prices re-trace over recent months, in some cases significantly. 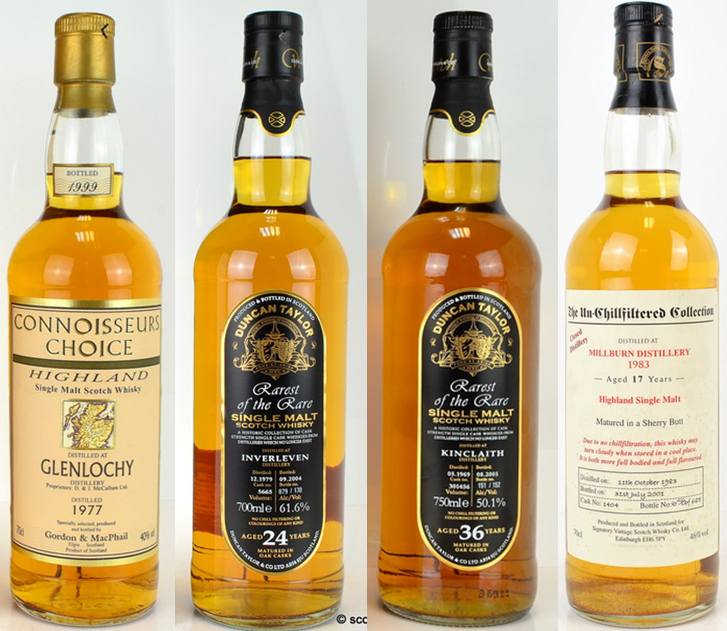 The recent Scotch Whisky Auction sale saw some encouraging green shoots (or spikes?) for the brand with the first notable record/increased prices for many months. Three bottles in particular performed exceptionally well. Redder Still, the follow up to the very rare Blacker Still, broke £400 for the first time. £410 took the bottle, some £30 over its previous best and roughly double its recent £175 – £220 trading range. The 1991 vintage Yellow Submarine (Sub image on bottle but not tube variant) fetched £150; not quite a record but way ahead of recent sales performance and a country mile apart from its 2009 price of £35 – £40. Harrison Ford features on the third high performing ‘Laddie; the Valinch bottling “Temple of Drams” achieved £310 (a second bottle sold for £260, equalling the previous record), way ahead of its 2011 low of £65. Having said that, a good whisky auction wouldn’t be a good whisky auction without at least one bottle of Bruichladdich plumbing the depths of loch-Dhu-esque badness. One of 376 bottles released from cask number 1 (Wee Ruari) sold for £130, a record low. That represents a 77.6% crash from its £580 auction high and a 48.0% slump from its original £250 retail price. Staying on Islay and also staying with under-performers, Kilchoman values apparently haven’t bottomed out as deeper losses are crystallised. A bottle of the 2007 vintage ‘Single Cask Nation’ sold for £75 having previously seen £145 in 2013. The 2012 Feis Ile release sank below £100 for the first time when it achieved £90. Many other Kilchoman releases took to new lows giving value to drinkers and devout Kilchoman collectors but a lacklustre performance where values are concerned. Far more positively, one of the stars of the auction was from a distillery relatively rarely mentioned here. 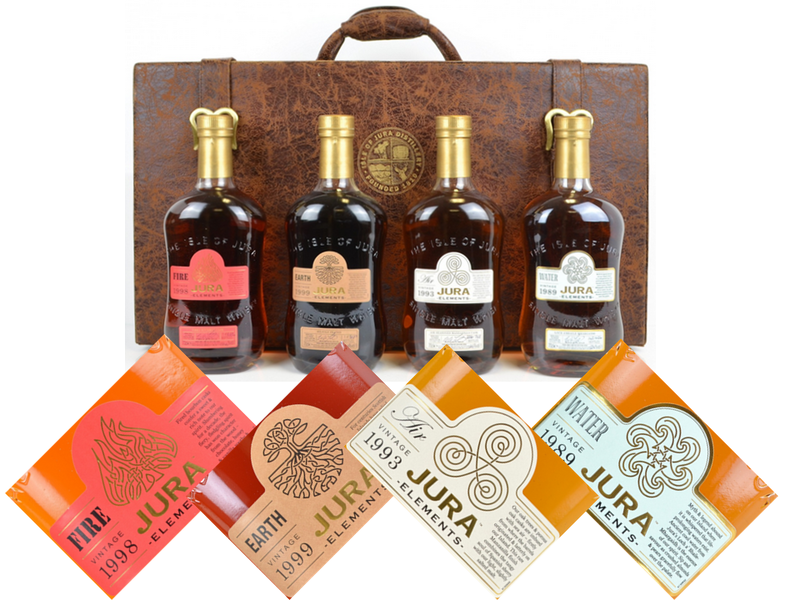 An exceptional £1,600 finished the bidding for a full set of Jura Elements (Air, Water, Earth and Fire). If you drink the bottles and are ever lost for luggage, they also come in a rather attractive suitcase. The previous price for this set was £350 in 2012. 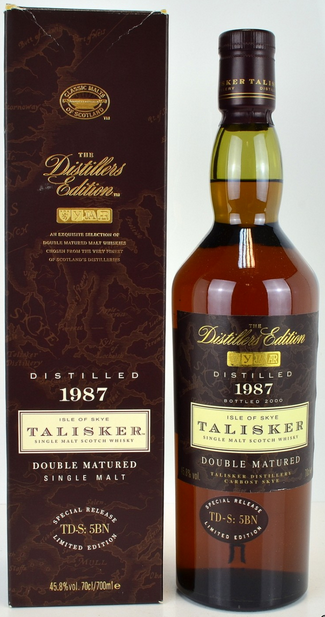 The Talisker 1987 is now the most expensive Distillers Edition sold at auction, edging convincingly ahead of previous record holder Lagavulin (£725 for a 1979 vintage). Almost in preparation for this years Feis Ile, the 2014 Feis Lagavulin made £330. £350 is the all-time record; none the less, £330 represents a 65% uplift in less than a year. Mentioned last time, but certainly worthy of an ongoing watching brief, Macallan saw values continue to polarise. Coronation hit a £500 low and the Masters of Photography series moved deeper into the red. Liebovitz’s ‘The Bar’ fetched £1,000 and Remix went for just £1,150 yielding a staggering 49% loss from its £2,250 high three months ago. Conversely, a bottle of Anniversary Malt 1968 vintage topped out at £1,650. That’s significantly ahead of its previous best £1,350 and some 587.5% above its £240 price in 2008. Port Ellen and Brora highlighted the continuing trend of independent bottles catching up with official bottles. OB’s for both distilleries remained static or re-traced slightly, whereas indie bottles showed increases. In general, prices were particularly buoyant for the vast majority of collectables, silent or otherwise. There were masses of new records, in fact far too many to mention in one update. Likening the current market to flavour profiles – It’s looking a lot less Loch Dhu and a lot more Brora ’72! And unless you’re looking for a replacement to creosote your shed, that has to be a good thing.